DD Form 1351-5, Government Quarters and/or Mess is a form used to substantiate the availability and use of Government quarters and mess facilities to determine the traveler's entitlement for payment for travel expenses incurred during official travel. The latest edition of the form was released by the Department of Defense (DoD) in July 1999 with all previous versions becoming obsolete. An up-to-date fillable DD Form 1351-5 is available for download or digital filing below. The information provided on the form is forwarded to law enforcement officials to investigate service members suspected of fraudulently obtaining reimbursements. All data within the DD Form 1351-5 may also be disclosed to other Federal agencies, the Congress and U.S. and State courts. The disclosure of this data is voluntary, but failure to provide it may result in the service member being refused reimbursement for all costs. MEALS SHOWN OPPOSITE THE FOLLOWING DATES OR PERIODS. THE NUMBER OF MEALS SHOWN OPPOSITE THE FOLLOWING DATES OR PERIODS. AUTHORITY: 5 U.S.C. 5701, 5702; 37 U.S.C. 404; and E.O. 9397 (SSN). Members of Congress, State and local government, and U.S. and State courts. DISCLOSURE: Voluntary; however, failure to furnish information requested may result in total or partial denial of amount claimed. personnel processing centers operated in conjunction therewith. utilization is not available or will not be available for a specific period. which a family is assigned for processing or control will assure that arrangements are made for the issuance of this statement. properly authorized and controlled facsimile signature stamp. his claim for travel allowances. The triplicate will be retained by the issuing office. covered by these definitions, see JFTR/JTR. 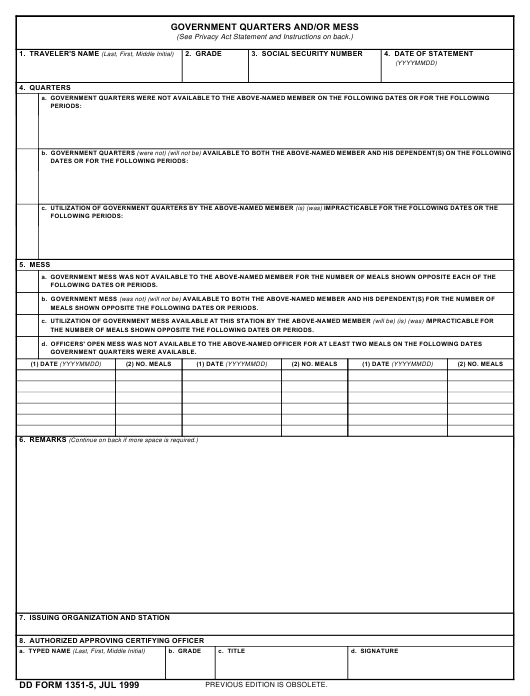 The DD Form 1351-5 is issued to the traveler at the location where the temporary duty is performed, at Ports of Embarkation or Debarkation or at personnel processing centers. It is provided to any member performing temporary duty assignments of 24 hours or more or traveling on Permanent Change of Station (PCS) to, from or between stations outside the United States. The form is initiated every time when quarters or Government mess facilities are not available to the service member at a recognized military or Government-operated installation. The DD Form 1351-5 is issued by a senior member in a position of command or administrative authority at the place of the temporary duty assignment. The commander of the facility will assure that arrangements are made for the issuance of the form. The statement will confirm the traveler's entitlement to compensation based on the non-availability or non-utilization of the facilities as indicated in the QUARTERS and MESS items on the front of the form. The traveler will attach the DD Form 1351-5 to his claim for travel allowances after the form is signed by the commander of the facility or their representative. The form may alternatively be authenticated by means of a properly authorized facsimile signature stamp. The DD Form 1351-2 also known as the Travel Voucher or Subvoucher is a related DoD-issued form. It contains a full description of travel routes and expenditures that will prove eligibility for reimbursement. The DD Form 1351-2C or the Travel Voucher or Subvoucher (Continuation Sheet) is a publically available continuation page used with the DD 1351-2. The DD Form 1351-3 or the Statement of Actual Expenses is a detailed table of all reimbursable expenses. It is used for describing lodging and meal costs, transportation and laundry expenses, and other local costs and tips. The DD Form 1351-6, Multiple Payments List is a form used by groups of DoD to document the payments made during travel.